Two Palestinian exit polls showed the ruling Fatah Party winning the most votes in Wednesday's parliamentary election, with the Islamic militant group Hamas finishing a strong second. Fatah took 46.4 percent of the vote in Palestinian parliamentary elections, while the Islamic militant group Hamas took 39.5 percent, according to a Bir Zeit University exit poll. That would translate into 63 seats for Fatah and 58 for Hamas in the 132-seat Palestinian legislature, pollsters said. A total of 8,000 voters in 232 polling stations were surveyed for the exit poll, which had a one-seat margin of error. An earlier exit poll by the Palestinian Center for Policy and Public Opinion gave Fatah 42 percent of the vote and Hamas 35 percent. Amid tight security and a sea of green and yellow flags, it was an historic vote integrating Islamic militants into Palestinian politics and determining the future of peacemaking with Israel. Polling stations across the West Bank and Gaza Strip closed on time Wednesday, after 12 hours of voting, the Palestinian Central Election Commission announced. Voter turnout for the first Palestinian parliamentary election in 10 years was 77.7 percent, the election commission said Wednesday. A total of 1.3 million voters were eligible to cast ballots. Turnout was 81.7 percent in the Gaza Strip and 77 percent in the West Bank, the panel said. 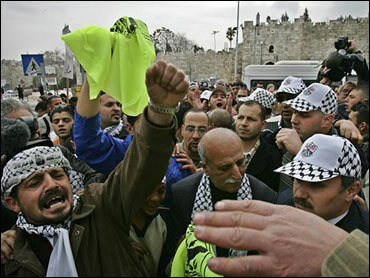 Some 3,000 voters cast ballots in east Jerusalem out of a total of 6,300 eligible voters. Both the ruling Fatah Party and its challenger, the Islamic militant Hamas, said they were confident of victory, but said they would consider a coalition if no clear victor emerges. Palestinian leader Mahmoud Abbas said he is ready to resume peace talks with Israel, even if Hamas joins his government after Wednesday's vote. "We are ready to negotiate," Abbas told Israeli reporters who were in the West Bank city of Ramallah to cover the election. "We are partners with the Israelis. They don't have the right to choose their partner. But if they are seeking a Palestinian partner, this partner exists." social organizations and charities (video). Palestinian voter Ibrahim Walid told CBS News correspondent Robert Berger (audio) he voted against Hamas because "They are religious. It shouldn't be a fanatic government." But a Hamas supporter said the group has changed from a militant group "to a political group." "I don't see any Israeli government negotiating with Hamas," Israeli Ambassador to the United Nations Dan Gillerman said on CBS News' Up To The Minute. "I believe the Israelis should be aware that we think as highly or poorly of their political class as they think of our political class and factions," responded Afif Safieh, head of the PLO Mission to the U.S. "Yet, we don't issue vetoes that this party or that politician shouldn't be running for election because he doesn't meet with our approval." Across the West Bank and Gaza, long lines formed outside polling stations, as Palestinians — given a real choice for the first time — were eager to cast their ballots for the 132 parliament seats up for grabs. In all, some 1.3 million voters were eligible and by early afternoon, more than 40 percent had voted, election officials said. Even it doesn't win outright, Hamas is widely expected to make a strong showing that would place the Islamists — responsible for dozens of suicide bombings against Israel — squarely inside the Palestinian political system for the first time. Hamas' success has alarmed Israel and the West, though Palestinian leader Mahmoud Abbas has argued that bringing them into the system will tame them, enabling peace moves to go forward. In an apparent sign of pragmatism, Hamas has not carried out a suicide attacks since a cease-fire was declared a year ago. But on Wednesday, its top parliamentary candidate, Ismail Haniyeh, said Hamas had no intention of laying down its arms after the elections as Abbas has said he expects. And another prominent candidate, Mahmoud Zahar, said his group is "not going to change a single word" in its covenant calling for Israel's destruction. Abbas, elected a year ago, will still head the Palestinian Authority regardless of Wednesday's results, but the voting will usher in a new Cabinet that could include Hamas members. Israel says it will not deal with Hamas until it disarms. The day had a festive feel — some party activists decorated their cars with red carnations, as if for a wedding — and few disruptions were reported, despite initial concern about possible violence. In the West Bank refugee camp of Balata, gunmen who had threatened to derail voting checked their automatic rifles at the door before casting their votes. However, right-wing Israeli lawmakers and extremists attempted to force their way into a Palestinian polling station in east Jerusalem, with 75 policemen blocking their way. And in the southern Gaza town of Khan Younis, police fired into the air to push back a crowd of impatient voters jostling their way into a polling station. Fatah, tainted by corruption after 12 years in power, was asking voters for another chance to pursue an elusive peace deal with Israel. Hamas has focused on clean government, and criticized Fatah's attempt at compromise with Israel as a sign of weakness. Activists from both parties were out in full force early Wednesday, handing out lists of candidates' names, baseball hats and scarves. But the Hamas effort appeared more organized that Fatah's. "These elections will determine the fate of the Palestinian people," said Mohammed Shaabein, a 71-year-old retiree in the northern Gaza town of Beit Lahiya. Some 13,500 police officers deployed at 1,008 polling stations, taking up positions on rooftops and at entrances to enforce a weapons ban. Nearly 20,000 local observers and 950 international monitors, led by former U.S. President Jimmy Carter, watched the vote. There were some allegations of fraud in the 1996 parliament election and the 2005 presidential election that brought Abbas to power, but international monitors said at the time the problems weren't widespread. "Both the Palestinian elections in the past have been very good. They have been honest, fair and free of violence and I hope and believe we will have the same thing today," said Carter, who monitored voting in disputed east Jerusalem. Wednesday's election marked the first time Palestinians have a clear choice between two political camps since Hamas boycotted the 1996 vote. Under Palestinian law, the largest party would be asked to form a government. Hamas is expected to ask for service ministries — health, education and welfare — and to leave diplomacy, including contacts with Israel, to others. Hamas, which has long ruled out negotiations with Israel, has signaled some flexibility on the issue in recent days. Fatah leaders have also predicted they'll get more than half the parliament seats. But if forced to form a coalition, Fatah prefers to govern with smaller parties and would invite Hamas only if left with no other choice. Israel's acting prime minister, Ehud Olmert, said Wednesday he hoped Palestinians would not "choose again the extremists who have led them from tragedy to tragedy and to sorrowful lives."